Located at the northern end of Portsea Island, for most of its history Hilsea was a small hamlet on the Portsmouth to London road. 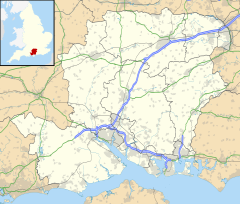 The boundaries of Portsmouth were not extended to encompass the hamlet until 1832. The last working farm in Portsmouth, Green Farm, was located in the area up to the 1990s. This area is now a residential estate and is marked by a pub and hotel still known locally as the Green Farm, although its external sign bears only the name of the Toby Carvery chain which now owns it. Construction of Hilsea Barracks started in 1780. Over the decades they underwent various rebuildings and changes of use before being knocked down to allow for housing development in the 1960s. In the years after 1926 Hilsea expanded with the building of the Hilsea Crescent Estate which was constructed on former allotments. The north of the district composes the Hilsea Lines, former defensive fortifications that are now a nature reserve. In the 1930s western end of the line's moat became known as the Hilsea lagoon and in the mid-1930s work was done on the banks and it was turned into a boating lake. In the same period the land around the eastern end of the boating lake was converted into Hilsea bastion gardens. Most of the gardens were destroyed as the result of road widening in 1968–70. The terraces that formed part of the gardens were demolished in 2000. In 1938 a bridge was built across the boating lake section of the moat. It was demolished in 1999 and later replaced by the current structure. The area is home to the Coach & Horses pub. This was originally the first public house reached when arriving on Portsea island from the mainland. It was damaged in a fire in 1870 and had to be rebuilt. It was again rebuilt between 1929 and 1931 to a design by A.E. Cogswell and this is the building that stands today. Another facility in the area was the Hilsea Lido which opened in July 1935. It closed in 2008 although attempts are being made to reopen it. Modern Hilsea is a mixture of residential and industrial areas. One of the major routes into Portsmouth still runs through the area. In addition, a small station serves the area. ^ "Portsmouth Ward population 2011". Retrieved 18 October 2015. ^ "Gatcombe House". British Listed Buildings. Retrieved 5 December 2016. ^ Mitchell, Garry (1988). Hilsea Lines and Portsbridge. p. 30. ISBN 0-947605-06-1. ^ a b Smith, Jane (2002). The book of Hilsea Gateway to Portsmouth. Halsgrove. p. 29. ISBN 1-84114-131-3. ^ Smith, Jane (2002). The book of Hilsea Gateway to Portsmouth. Halsgrove. p. 34. ISBN 1-84114-131-3. ^ Smith, Jane (2002). The book of Hilsea Gateway to Portsmouth. Halsgrove. p. 53. ISBN 1-84114-131-3. ^ Smith, Jane (2002). The book of Hilsea Gateway to Portsmouth. Halsgrove. p. 62. ISBN 1-84114-131-3. ^ a b Smith, Jane (2002). The book of Hilsea Gateway to Portsmouth. Halsgrove. pp. 72–74. ISBN 1-84114-131-3. ^ Slater, John (July 2006). "Hilsea lido area action plan – preferred options" (PDF). Portsmouth city council. p. 6. Archived from the original (PDF) on 7 March 2012. Retrieved 18 September 2010. ^ a b Smith, Jane (2002). The book of Hilsea Gateway to Portsmouth. Halsgrove. p. 70. ISBN 1-84114-131-3. ^ a b Smith, Jane (2002). The book of Hilsea Gateway to Portsmouth. Halsgrove. p. 17. ISBN 1-84114-131-3. ^ Smith, Jane (2002). The book of Hilsea Gateway to Portsmouth. Halsgrove. p. 44. ISBN 1-84114-131-3. ^ Smith, Jane (2002). The book of Hilsea Gateway to Portsmouth. Halsgrove. p. 61. ISBN 1-84114-131-3. ^ Judd, Emma (22 September 2010). "Hilsea Lido trust: There is still work to do". The News. Retrieved 26 September 2010. ^ a b Smith, Jane (2002). The book of Hilsea Gateway to Portsmouth. Halsgrove. p. 60. ISBN 1-84114-131-3. This page was last edited on 26 November 2018, at 20:34 (UTC).